FAQs provide immediate answers to some of the routine, but necessary, questions that customers ask and need to know. Due to the vast terrain of the Himalayas and associated uncertainties of weather , it is impossible to predict snow availability (a very common question by customers travelling long distances). We must agree that seeing and playing on snow has become a major game of luck in some seasons which, earlier, we took for granted. What is the purpose of Trekking? The primary purpose is recreation by moving away from the hustle and bustle of cities and to explore or enjoy the serene wilderness / outdoors that cannot be reached in vehicles or other modes of transport. What is the equipment required for Trekking? Trekking requires very basic equipment if it is a day hike – good shoes, comfortable clothing, personal medicines, torch, knife, food and water stowed in a backpack. If overnight stay is planned, the equipment list will include tents, clearing equipment, cooking utensils, burners. Quantity will vary depending on the duration. If trekking involves entering unknown area, navigation and communication equipment may become necessary. The basic principle is to carry light weight but only essential items so that one may enjoy the activity. Being amidst natural environment can give major rejuvenation for the mind and body. Besides, people come closer and bond better with each other as they have union of purpose. Basic human values like humility, being down to earth, respect for Mother Nature, leadership and organizing skills can develop during treks. Physical hardships during treks can prepare one to handle career and domestic pressures with much ease. Animal attack, snake or insect bite, water borne diseases, getting lost are some of the major risks involved with trekking. Minor risks include, tripping and falling, injury thereof, mal nutrition, dehydration, loneliness and the like. The minor risks are generally due to one’s own folly and poor planning while major risks can be avoided by using known routes, employing a guide and careful attention to surroundings..
What are the skills necessary for Trekking? 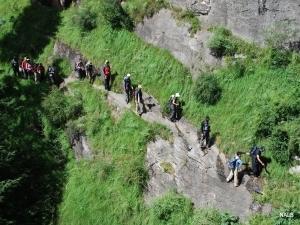 Mountaineering is a sport which involves hiking, trekking and climbing mountains. Climbing skills require extraordinary fitness, experience and equipment to negotiate and safely climb or cross rocks, rivers, snow, glacial ice and other hurdles or hazards found particularly on mountains. This sport is always in groups of at least 2 persons and is gaining popularity due to availability of advanced equipment and the adrenalin rush that it provides. What is the purpose of Mountaineering? It is in human nature to explore, face challenges and accomplish feats that require extraordinary courage and skills. Some people may swim across the cold English channel or walk cross the poles. The Mountaineer climbs mountains because they are there. What is the equipment required for Mountaineering? What are the risks or hazards involved in Mountaineering? Serious injury and even death are the risks faced by Mountaineers due to hazards that are categorized into Subjective and Objective hazards. Subjective hazards are man made that include but not limited to injuries arising from tripping and falling, high altitude sickness, poor planning and accidents caused by poor equipment, sun burn, snow blindness, getting lost and stranded. Objective hazards are caused due to nature and beyond the control of the climber – sudden onset of inclement weather, lightning, blizzards, avalanche, rock fall, landslide, flooding etc. Costs vary from almost nothing to several thousands. Trekking costs in India vary from 750 per day to about 3000 per day depending on the route, season, activity involved and number of days. Mountaineering expeditions are generally long drawn, involve several weeks of planning and preparation. Advance study of route and hazards, camping areas is necessary for assessing safety, equipment required and summit planning. After choosing a peak for climbing, permits have to be obtained from concerned authority (IMF in India), delegation of rescue team, porters, ration and publicity may run into lakhs of rupees. These days, most of the expeditions are sponsored either by state or parent organizations (army, police, societies, companies..) once mission objectives are clearly stated. Also known as Acute Mountain Sickness (AMS), exposure to the low pressure / low oxygen prevalent in higher altitudes is known to cause pathological changes in the climber leading to several symptoms – some of which are minor and some fatal. Generally people show different symptoms above 2000m (6500 feet). It has been well documented that gradual ascent during climbing can reduce or even prevent onset of Altitude Sickness. This process is known as Altitude Acclimatisation in which the body is exposed to higher altitudes more gradually so that adjustment to low pressure / low oxygen is possible. The golden rule followed by climbers is “Climb high and sleep low” wherein they ascend to a higher altitude at the end of the day but sleep at a lower altitude (say 500m below). A typical acclimatization process will be a few days stay at a base camp, climb to a higher altitude and return to base camp. A subsequent climb to the higher camp will include overnight stay. This process is repeated as altitude is gained and the body gets adjusted to the lower pressure prevalent. During this process it may emerge that some climbers require more acclimatization than the rest. Consumption of alcohol should be avoided as this leads to dehydration and hence compound AMS. How to handle HAPE or HACE? As soon as symptoms emerge, further ascent must be stopped and the patient must be prepared to descend. A reliable treatment is to descend rapidly as soon as possible and symptoms have shown to improve dramatically in most cases. Where movement is not possible or circumstances do not permit, it becomes dangerous to treat the patient unless advanced medical facilities or supervision is available. Use of oxygen, gamow bags (pressurized bag), steroids may buy time to descend but may not fully treat AMS. 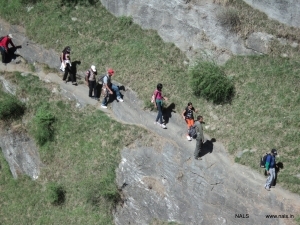 NALS stands for NATIONAL ADVENTURE AND LEADERSHIP SCHOOL, an organization that uses experiential learning techniques like adventure, camping and trekking to develop family bonding, survival instincts and leadership skills. Human beings have lived in groups for hundreds and thousands of years. Group behaviour and social needs necessitate the evolution of one leader who can give direction to the group. Such collective effort under a leader has lead to the survival and sustenance of human races. Leadership is required at all levels either be it individual or social or community or state. An individual has to be leader himself so as to give direction to himself and also be a servant leader. Religious groups require and have had leaders for thousands of years and these leaders (or heads) generally command great following. Countries elect leaders who have vision and outstanding communication skills so that he or she may lead the people and country to a higher standard of living and safety. The absence of credible leader will create Leadership Vacuum. Again, this is possible at all levels, but can cause much damage if public opinion becomes divided and no true leader emerges at the state level. What is the vision of NALS? We at NALS have recognized that Leadership and survival skills are two important traits that can change the destiny of a Nation. Our vision is to inculcate these traits in all our participants and most of our programs are designed around these concepts. The NALS family challenge program is one such program specifically designed to reinstate either parent as a role model in the mind of a child. What is Outward Bound Learning? Outward Bound Learning, in short OBL, is a form of learning, wherein participants are moved away from their comfort zones and sheltered in places with minimum comforts and maximum excitement. The excitement comes in the form of floor level or adventure level activities or games. These activites can only be accomplished by team work and communication skills. Such activites hone the skills that were designed as objectives of the OBL program. Many corporate training programs for staff include OBL in the agenda. Do participants need experience and skill for adventure activity in your programs? No prior experience is required for the adventure activity provided in our programs. NALS will provide safety lecture, equipment and professional guidance. However, participant must possess a higher degree of fitness, good strength and endurance especially for the adventure expedition programs. Do I need to train myself before an adventure expedition program? Ideally yes. Adventure expedition programs are conducted in higher altitudes (above 2500m / 8000 feet) that require good physical strength, fitness and endurance. Participants are advised to train themselves at least 2-3 months prior to their programs to ensure they are capable of walking at least 10-12 kms each day and carry 8-10 kilos back pack. Please note that persons who have not done any physical activity should consult their physician before commencing such an activity. How are toilets in higher altitudes? Generally toilets are of traditional style – small pits on the ground and you drop a handful of mud after ablutions. Toilet tents are provided in most programs. Participants are advised not to pollute rivers and streams and seek assistance of Program leader if necessary. 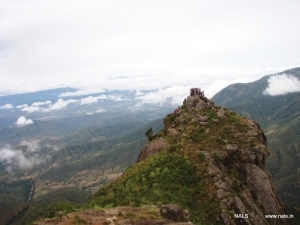 How do I take bath during the trek? As temperatures are low and water becomes very cold, taking bath may not be an option during most treks above 2500 m / 8000 feet. However, on a bright sunny day, if time permits, one may take a quick dip in a stream while being conscious of the fact that people downstream may use the water for drinking. Also be aware that mountain streams cause sudden floods due to heavy rainfall in some other area. Caution is necessary. Please consult your Program Leader and he may advice if your program route allows such a luxury. Kindly note that there are perennial hot springs beside NALS campsite at Kalath, HP. What type of food is provided in your programs? Simple, nutritious and hygienic vegetarian food is provided in our programs. Additionally, plenty of fluids (soup, juices, refreshing drinks) are provided through the day so that participants are hydrated properly, especially during high altitude programs. The menu is carefully prepared to include sufficient proteins and carbohydrates. Non Vegetarian food is not provided for the following reasons - High chances for contamination due to lack of refrigeration in the higher altitudes; smell of meat or leftovers attracts other animals; Meat is attributed as one of the principal reasons for global warming. Are phones available on the trek routes of adventure programs? Telephone towers are not available above 2500 m / 8000 feet and you will be out of communication with the rest of the world during most trek programs. Participants are advised not to use cell phones during the program. Student programs strictly prohibit the use of cell phones. This may be an exhilarating experience for most of us permanently tethered to phones during our normal day. However, it is possible that in future, networks will expand and make phones work (and thereby destroy our peace…!) in all areas. What is the average day like during adventure program? This is a sample day at higher altitude adventure program. Timings / schedules and menu may change according to each program needs and situation. 0530 – Bed tea 0730 – Breakfast (bread sandwich or paranthas or pooris with porridge etc with tea) 0830 – Trek commences. If camp is shifted, complete packing of tents and baggage is shared by all followed by campsite cleaning. Packed lunch (roti + sabji) will be provided. 1030 – Packed juice / banana or dry fruits 1600 – Reach another camp or return to same camp. Tea / refreshing drink + snacks 1900 – Soup 1930 – Hot Dinner (Rotis + Dhal + Sabji + salad) 2015 – Group meets with hot chocolate or custard or horlicks etc 2130 – Go to bed after sky watch – Persons with or without knowledge of Astronomy will love the view of our night sky so clear of dust and city lights. 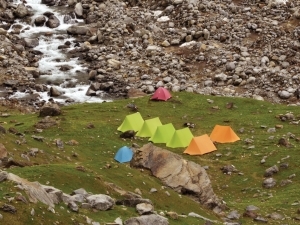 What is the weather at NALS campsite in Himachal Pradesh ? Summer - Maximum 30 Deg C Minimum 15 Deg C Winter - Maximum 15 Deg C Minimum -5 Deg C Himalayan weather is unpredictable and hence visitors are requested to be prepared for sudden changes. The words are not coming out of my lips but it has come out at the bottom of my heart to convey my sincere thanks and to appreciate their team work for the following points.